A lawyer accidentally gets the soul of a snobbish, wealthy aristocratic woman looking for a second chance placed in his body. Now, he must find the young woman who volunteered to host her soul or be stuck with her forever. 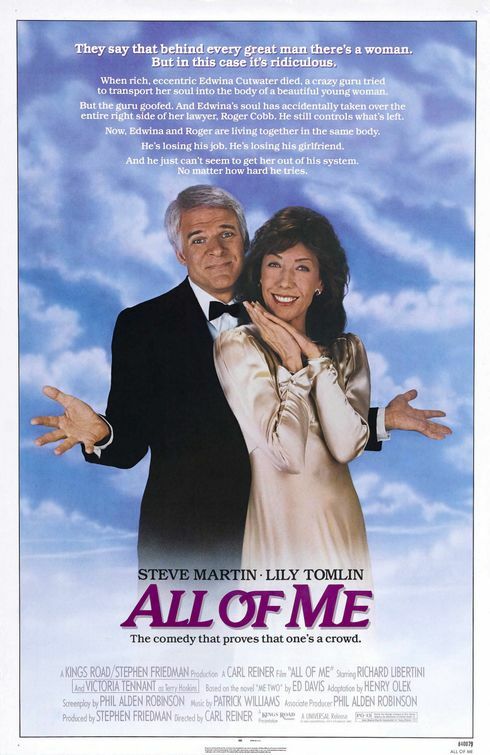 "All of Me" is directed by Carl Reiner based on the novel "Me Two" by Edwin Davis. It stars Steve Martin as Roger Cobb, an attorney and musician who gets an off-assignment from his firm. He is sent to handle the estate of a young, dying, wealthy, snobbish aristocrat named Edwina Cutwater, played by Lily Tomlin. She has an odd request: she wants to leave all of her money to the daughter of her stable-hand named Terry Hoskins, played by Victoria Tennant, who has agreed to be a host for Edwina's soul after her death. Upon Edwina's death, a kerfuffle causes Edwina's soul to wind up in the body of Roger, who butted heads with her quite a bit. Of course, hilarity ensues once the two are trapped together. Steve Martin is forced to act out the personalities of both souls inhabiting his body, two souls that don't like each other, come from very different backgrounds, and have very different values and quirks. Steve Martin does a fantastic job acting out these duel personalities as he regularly argues with himself. He even sometimes struggles to walk and do other simple tasks as each personality controls one half of his host body. Martin has great witty banter with Tomlin's inner voice that kept us laughing often. Tomlin, though not always in physical form, has a menacing, omnipotent presence for her host body, appearing in mirrors as her real self, almost always to scold Roger for doing something stupid. Though they argue a lot, it's still riotous to watch and the chemistry is always there between the two. Sure, "All Of Me" is a little silly and somewhat stupid, but we didn't know what to expect and wound up enjoying this film, almost always because of Martin and Tomlin's wild and zany performances.